Are you about to move to a bad neighbourhood? Enter your postcode below to begin. Excellent publication. Really gave me a great insight into the area. A brilliant idea and very pleased with the service. This is amazing, and really detailed. I welcome a resource this thorough. Buying a new house is the most expensive decision you'll make in your life, and certainly the riskiest. No wonder then, that home buyers have concerns about the neighbourhood, not just the property. People like you are desperate to find out as much as possible about their new neighbourhood before they move. You want to know if your new neighbourhood is going to be a safe, happy and secure one. "Big data" has revolutionised the way we buy homes. Not so long ago, you didn't have information to help you gather information about a neighbourhood. But you do now. 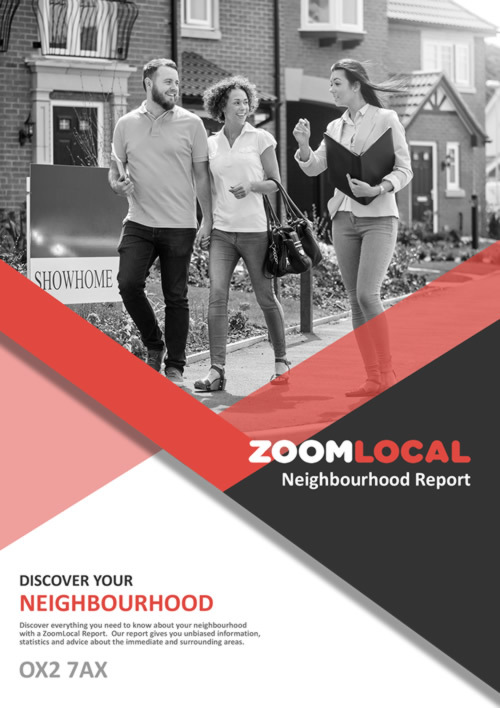 ZoomLocal Neighbourhood Reports bring together a massive wealth of data from over 80 sources, into one easy-to-understand report that's easily downloaded and printed at home. As well as consolidating data from official sources (such as ONS, Land Registry, Ofsted etc), we also include data that's not available elsewhere; information that's taken us more than a decade to put together. Not only are you getting an unrivalled amount of local information, you're also saving yourself time: it would take days to gather this information yourself. Let us do the legwork for you. How do ZoomLocal Neighbourhood Reports help you? You'll learn who the neighbours are, what jobs they're likely to have, how much they earn and how old they are. You'll discover whether the neighbourhood has a crime problem that's likely to make your life a misery. You'll find out whether the average property prices are rising - or falling. If you've got children then you'll be able to decide which schools are best for them. Our reports will also tell you whether there's anything nearby that may be a nuisance, such as power stations, noisy factories, smelly waste disposal units, solar parks and animal processing plants. And of course there's a massive amount of information about local amenities. We've got your neighbourhood covered - supermarkets, doctors, pharmacies, hospitals, post boxes, cash machines, banks, train stations, bus stops, car parks, the lot. Your estate agent won't tell you this stuff. They want to make the neighbourhood as enticing as possible, and keep the bad stuff under wraps. Their job is to sell you a house, so they won't tell you how bad the neighbourhood is. We help you discover the truth. This isn't just a neighbourhood report that helps you decide whether to move to a neighbourhood. This is a report that you can refer back to even after you move in, to help you settle in and become familiar with the area. A ZoomLocal Neighbourhood Report is essential for a stress and risk-free move, backed up with a 100% no-quibble money-back guarantee. If you don't think it's helped you, we'll give you your money back. Browse some of the pages inside our 50+ page ZoomLocal report and see for yourself how we can help you discover the good, the bad and the ugly. Use the 'Prev' and 'Next' buttons to flip through the pages. Moving house is risky. 44% of homebuyer's concerns are about their new neighbourhood. Conveyancing doesn't cover these concerns. Our reports are designed to eliminate the worry about your new neighbourhood area. Don't make the mistake of moving to a neighbourhood which you and your family will regret. Our 50+ page local homebuyer's report reveals everything you NEED to know about your new neighbourhood before it's too late. You want to be sure that your ZoomLocal neighbourhood report helps you choose the right area. We're so sure you'll be delighted with your local neighbourhood report that we'll refund you in full if you're not completely happy. What's included in our report? Yes, that's a LOT of information to include in every report. But don't take our word for it. See an example report BEFORE you download your own, to see exactly how we can eliminate the worries associated with moving to a bad neighbourhood. With a ZoomLocal report you can play it safe in the knowledge that you're moving to a safe, clean and happy neighbourhood with all amenities within easy reach. Our 50+ page homebuyer's local report contains a raft of comprehensive information designed to eliminate the risk of moving to a bad neighbourhood. Your happiness and well-being depends on local knowledge, so download your local neighbourhood report before you commit to buying that dream house.